This home experienced extreme storm weather and ultimately resulted in a water loss. The tarp shown in the video was put up to stop any further damage from taking place. Soon after our crew began the mitigation by placing drying equipment and removing wet insulation. 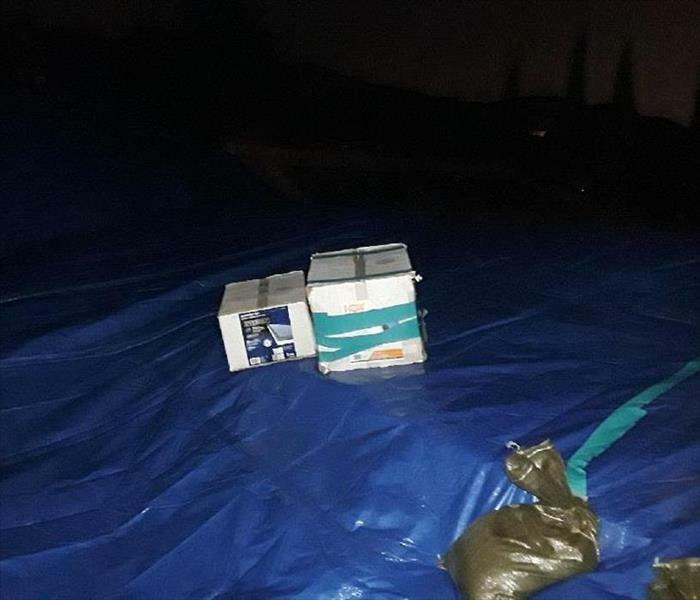 When a business suffers an unwanted water intrusion in the Los Angeles area, the call is often made to SERVPRO for help. 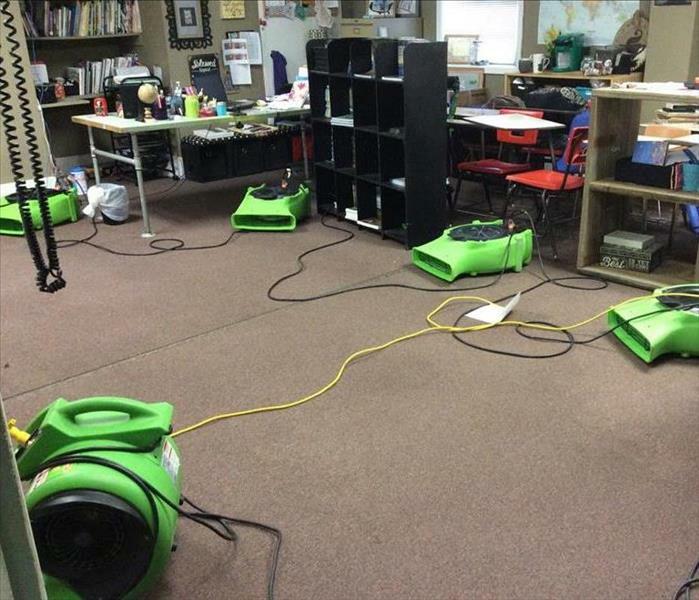 We're Faster To Any Size Disaster; we can quickly vacuum up the water and place drying equipment to make you feel "Like it never even happened." 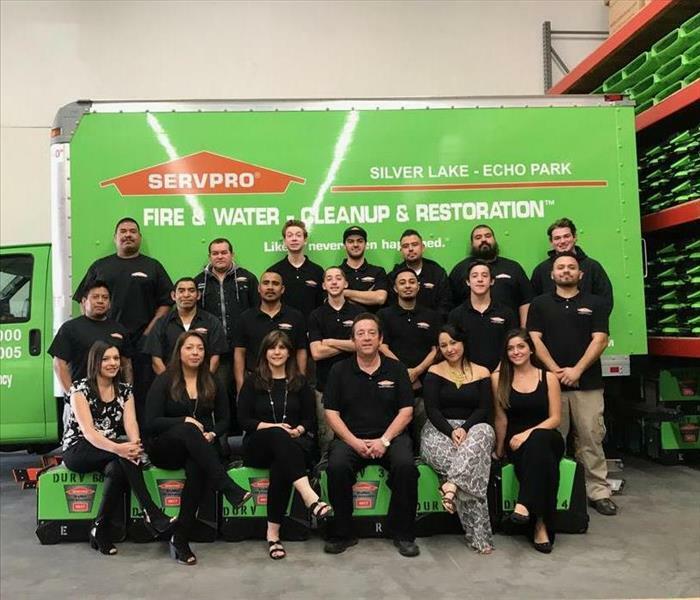 The crew at SERVPRO of Silver Lake / Echo Park has the equipment, training, and experience to restore your home to pre-damage condition quickly and efficiently. Our crew is IICRC certified and the best in the restoration industry. We are ready 24/7, locally owned and operated, and Faster to Any Size Disaster. 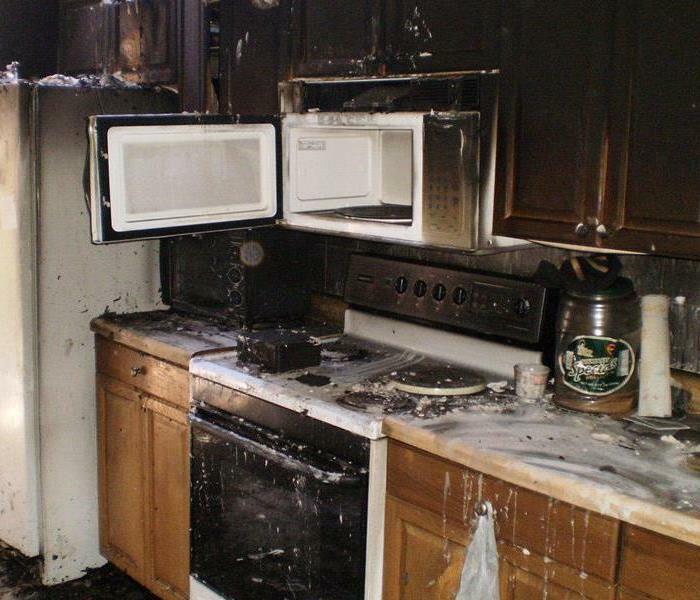 This was the result of a kitchen fire in Toluca Lake. When we arrived on site, much of the home was severely damaged by smoke and soot. Once our crew began work the home owner realized that we were going to clean and rebuild the structure "Like it never even happened". This composite photo illustrates the extensive fire damage done to an outdoor area of a Northern California home. 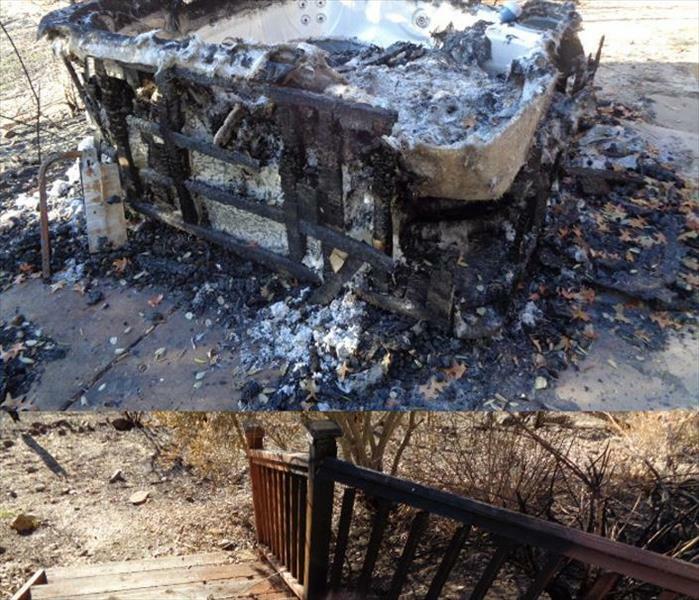 The spa and deck steps and railings were burnt from the recent wildfires. Our trained FST technicians can swiftly remove the non-salvageable elements and prepare the site for rehabilitation "Like it never even happened." Our team of trained and certified technicians, subcontractors and office staff are the most professional and experienced restoration specialists you will find in L.A., bar none!. With a branded company that has been in property restoration for over 50 years, our Institute of Inspection, Cleaning, and Restoration Certification certified team members, state of the art equipment and processes; you can be assured that a reliable and trustworthy company will be handling your property restoration. 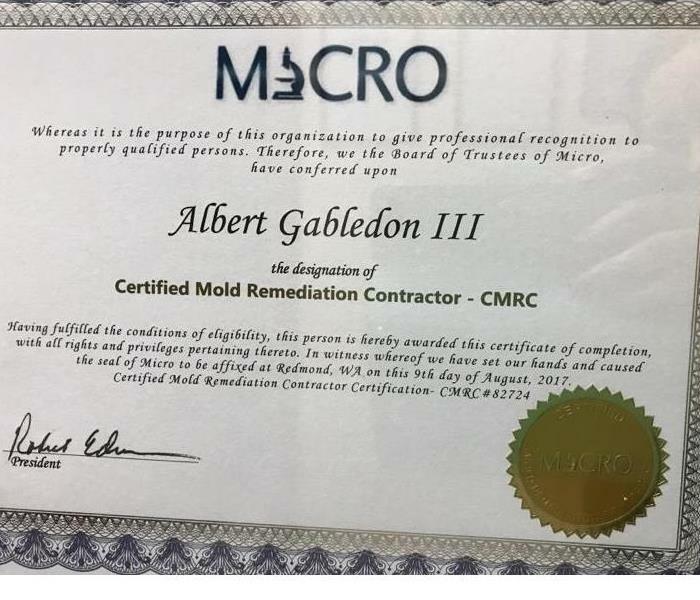 Albert Gabledon recently received a new certification for mold remediation. Certified Mold Remediation Contractor (CMRC) from the Mold Inspection, Consulting and Remediation Organization (MICRO). Micro is a division of the International Association of Certified Home Inspectors. Some Los Angeles area restoration companies advertise “mold removal” and some may even guarantee to remove all mold. This is not accurate because removing all mold from a house or business is impossible; microscopic mold spores exist almost everywhere, both indoors and outdoors. To learn how to protect your residential or commercial building, call our experienced team. Our team consists of highly trained water damage restoration experts. We specialize in flood and storm damage restoration. We have extensive water damage and storm restoration training that allows us to get your home back to normal quickly. Recently some members of the SERVPRO of Silver Lake / Echo Park team traveled to the Houston area to assist in cleanup efforts after Hurricane Harvey. We are happy to help. 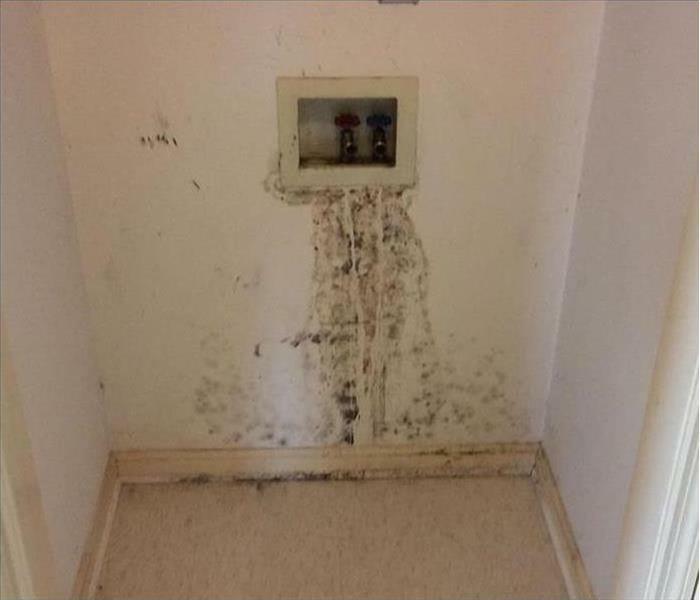 The washing machine drain hose leaked which led to a mold infestation in this Los Angeles Utility Closet. There was no leak to be fixed, so it was possible to scrape off the small infestation and treat with a biocide to sanitize the affected drywall. 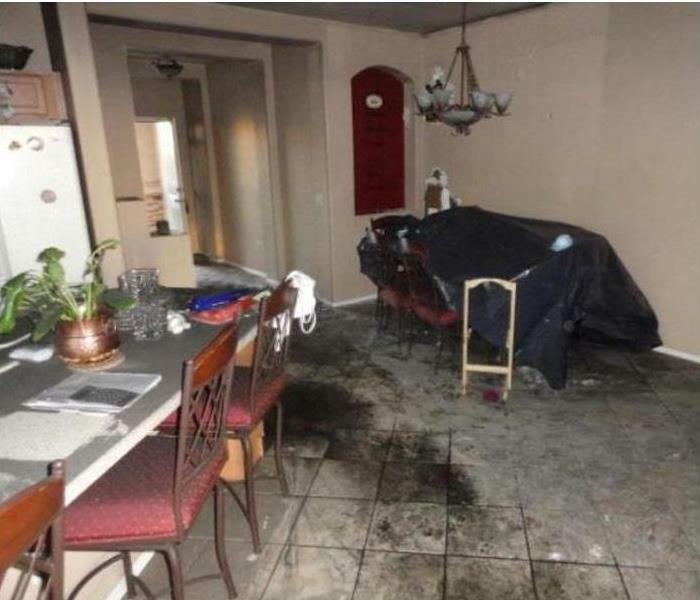 Water damage to this Silver Lake area winter home was caused by a sewage backup. There was a broken pipe under the slab. The owners were not in the Silver Lake area for three months, so the damage went undiscovered. SERVPRO technicians are trained in all aspects of water damage cleanup, and they conquered this very large problem, and the owners are now back in their home free of mold and water damage. An electrical malfunction in a refrigerator caused some major smoke damage in this home so the owner called up SERVPRO. Techs arrived on site to begin the clean up of the home. The ceiling and walls were wiped down, all wet materials were removed, the home was ozoned, and left prepared to begin the reconstruction. 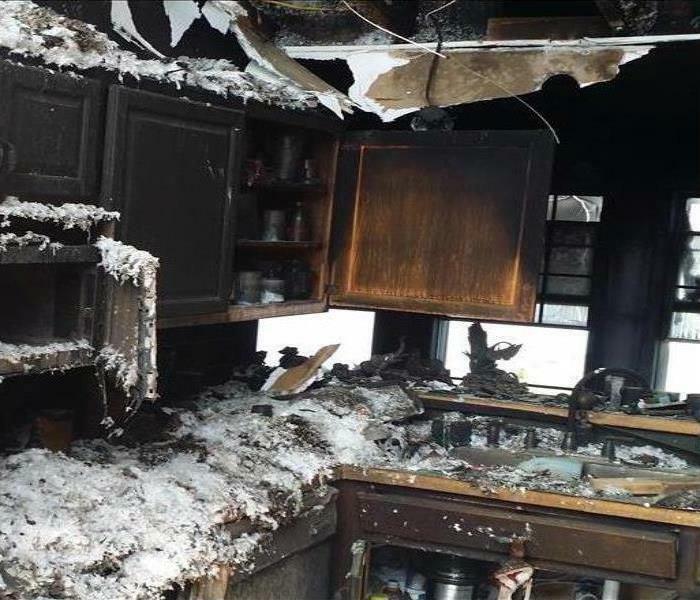 The damage caused by a grease fire in a restaurant caused the owner and her employees to halt their business hours and call some to help clean up the damage. SERVPRO of Silver Lake / Echo Park was on site and ready to get to work. Our techs were got straight to work and started power washing all the kitchen appliances. Every inch of the kitchen was left clean and degrease. The manager was happy she was able to get the restaurant up and running once our techs completed the work. A stove fire cause the home to be filled with smoke and activated the sprinkler system causing the walls and floors to be soaked. SERVPRO was called out to clean up the damage. Techs were able to clean up the smoke, dry out the structure, and left it ready to begin the reconstruction. Storm Damage to this Silver Lake home blew the sunroom apart. SERVPRO of Silver Lake / Echo Park was summoned to clean up the damaged area and to rebuild the sun room. The finished job picture shows what a great job was done. 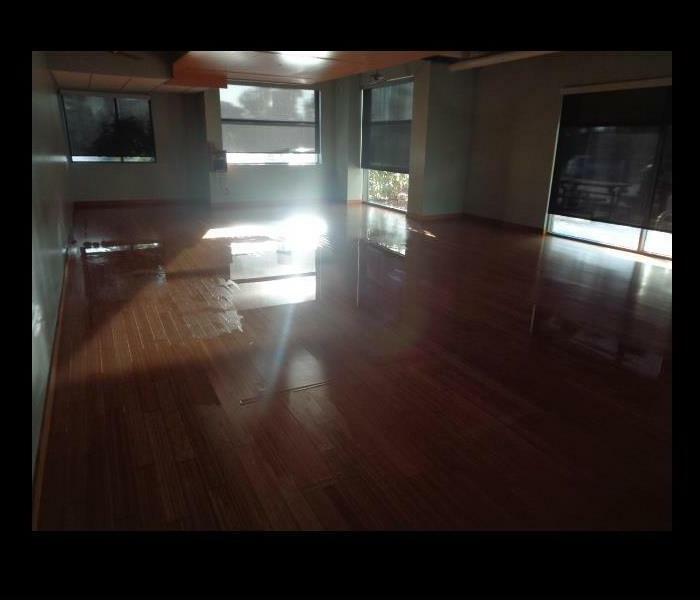 A yoga studio was drenched due to the sprinkler system going off. There were puddles of water everywhere, paper work was damage, and the owner wasn't able to open his doors for business. SERVPRO was called out to help dry everything. Techs were able to place equipment all along the floor drying it in place and saved it from needing to be removed. The owner was pleased to be able to open up his studio again. Due to a leaking deck this homes wall began to bubble from all the water collecting behind the paint. SERVPRO of Sliver Lake / Echo park was recommended to come out and access the damage. Techs were out at the home right away that contained the area to avoid over drying some expensive paintings the owner collected. 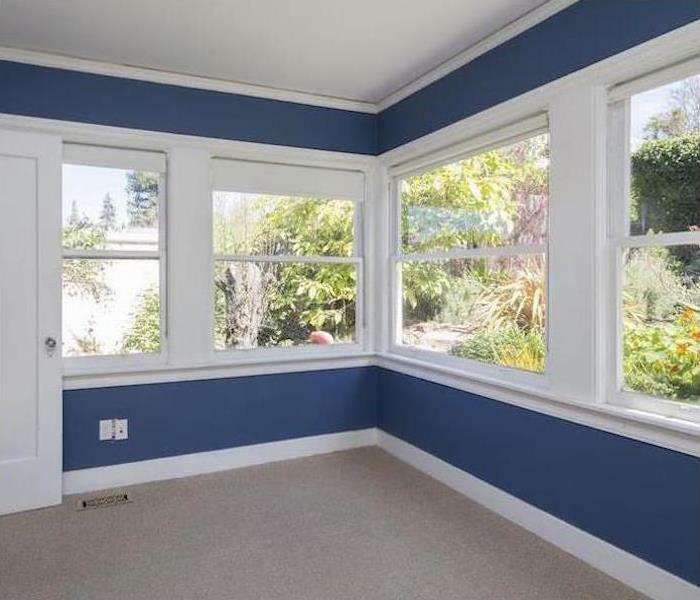 The damaged drywall was removed, the structure was dried out, and the drywall was replaced, painted, and left looking brand new after the techs were done with it. Due to all the resent rains a small crack in the wall lead to a whole lot of water to leak into this stores warehouse and show room leaving the carpets soaked. SERVPRO was called out to help dry that walls and carpet without halting their business hours. 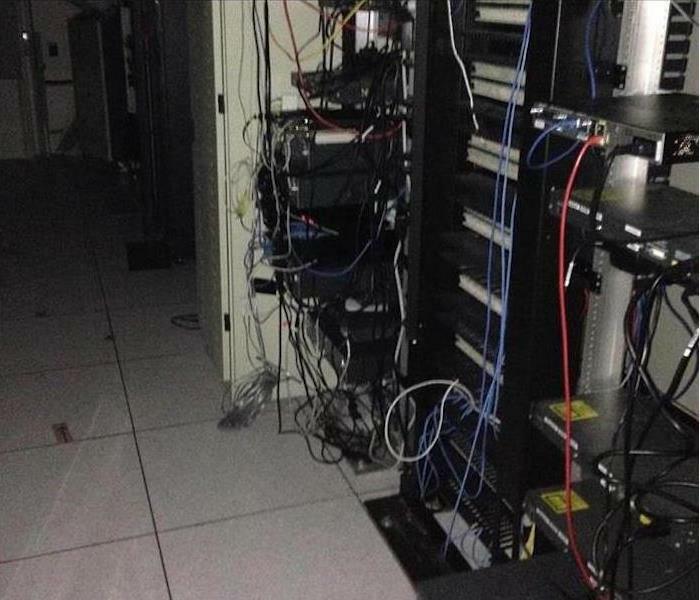 Luckily the techs were able to do just that and make it look "Like it never even happened." A firework mishap caused a whole room of this home to burn down along with breaking of windows due to the fire. SERVPRO was called out to help clean up the smoke damage, board up the broken windows, and dry out the home that had been hosed down by the fire department. Our tech were able to clean the soot and smoke in the home, dry out the affected materials, and left it prepped for reconstruction. 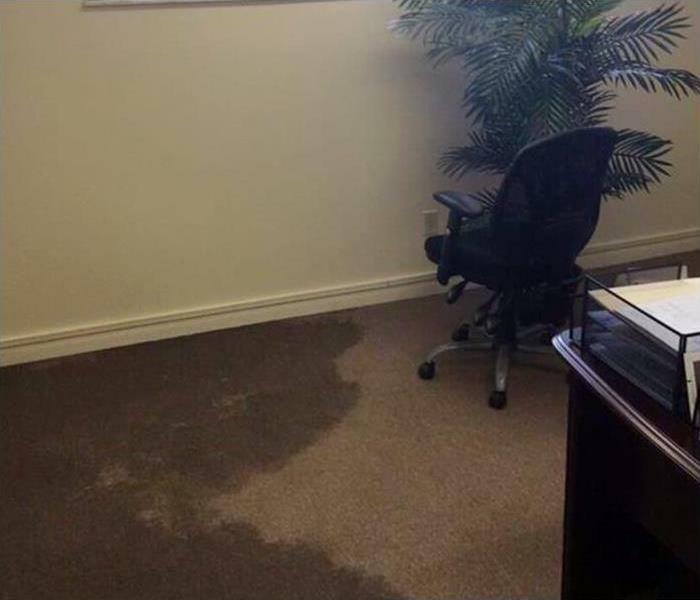 The carpet was saturated in this home office in Los Angeles due to driving rain water coming in from the balcony sliding door. SERVPRO of Silver Lake / Echo Park was called out and on site within the hour to assess the water damage situation. Our tech was able to lift the carpet without damaging it. The carpet was then dried in place with SERVPROs equipment. The owner was worried she would have to replace the carpet in the whole room. She was relieved when she was told everything was dried and put back into place. "Like it never even happened." A bathroom water line broke overnight and water spill through out this homes bathroom, hallway, 2 bedrooms, and a closet. Hardwood floors can be tricky to dry but the owner was pleased that we were able to save the flooring in the home. Tech were able to make it look "Like it never even happened." A clean water pipe burst underneath this Silver Lake condo. It cause the insulation to start to fall off the wood due to being so saturated in water. SERVPRO was called to dry out the crawlspace and remove all the wet materials. The owner was pleased that we were able to dry out the home and prevent any mold growth in her condo. 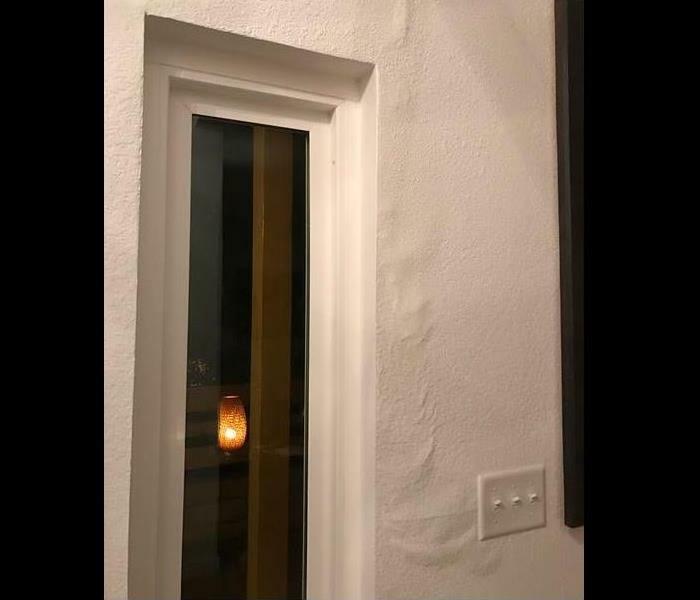 The affects of a pipe leak caused damage the wall and paint to come off a wall in a Los Angeles condo. The owner woke up to his bathroom wall looking like this. Turns out the condo above his had a water pipe leakage that when straight down into his bathroom. SERVPRO was called out to access the damage. 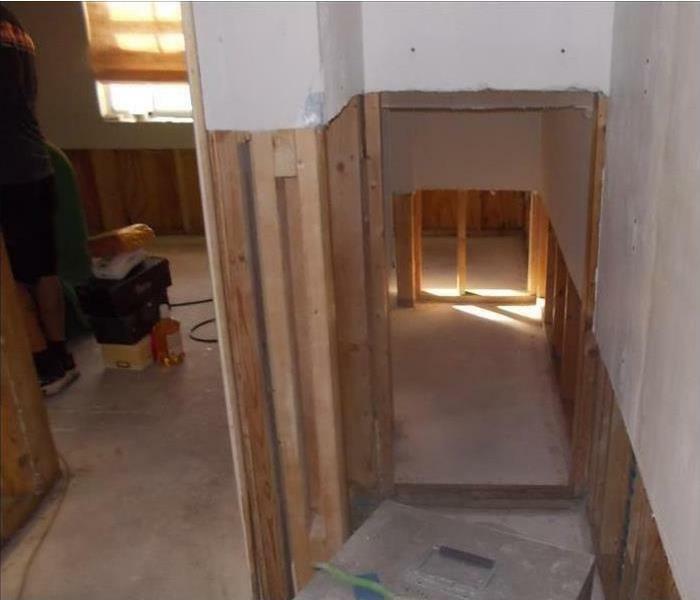 They dried out the wall and removed all the damaged drywall. It was left prepped and ready for reconstruction. A sewage leak happening on the street was able to seep into this Echo Park restaurant, halting their work and left a terrible smell through out the business. 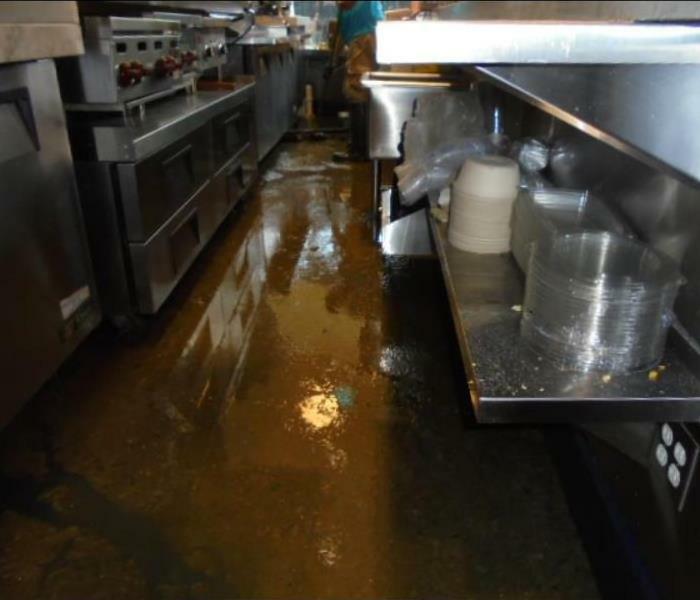 SERVPRO of Silver Lake / Echo Park was called out to clean up the sewage water and decontaminate the kitchen. Techs were out and ready to go as soon as they got there. All the water that had permeated the structure was extracted. Everything was wet wiped and sanitized leaving the business ready to reopen and get cooking again! The aftermath of a leaking shower pipe had gone completely unnoticed and hidden in the crawlspace of this home. It was only until after SERVPRO was called due to a water pipe having burst in the crawlspace that the damage had been noticed. Tech pack out the affected areas, completed the water mitigation in the home and promptly began the mold remediation in the bathroom. The affected area was contained, cleaned, and cleared to begin the build back. Damage to the flat roof of this home was cause by constant rain in the past months. The owner call SERVPRO of Silver Lake / Echo. Our techs began the water mitigation and removed all affected materials. Such prolonged water damage led to mold growth in the home and needed to be remediated. Techs contained the mold, cleaned it up, and left it prepped for reconstruction. An ongoing sink leak left the drywall behind the sink stained and moldy. SERVPRO of Silver Lake / Echo Park was called out when the owner of the home had noticed a strange smell coming from his cabinets. Containment was put up to prevent any contamination to the rest of the home. The cabinets and affected drywall were demoed. Everything wiped down with an anti microbial agent, seal, tested, and prepped for reconstruction. 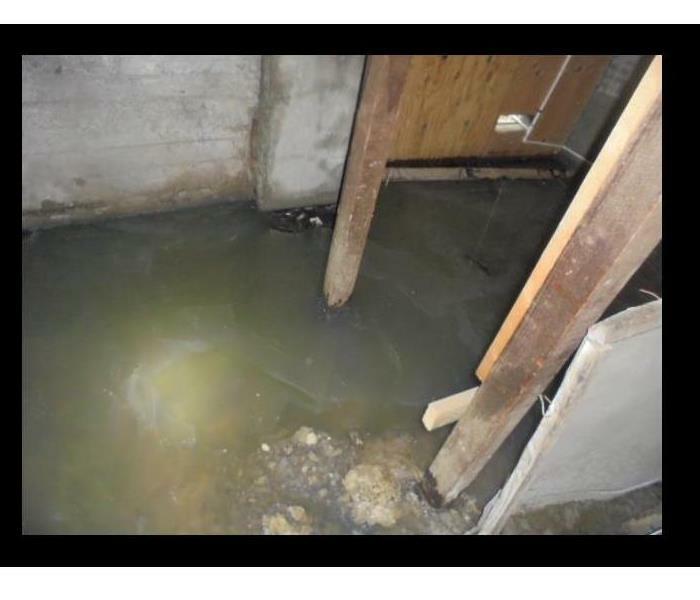 A broken sewage pipe lead to a crawlspace beneath an apartment complex looking bad and smelling even worse. SERVPRO of Silver Lake / Echo Park was called to help with the messy situation. They went in and extracted the black water, cleaned up the mess and dried out the foundation. Leaving the renters with a better smelling home. The damage done by a dryer that caught on fire in this home was extensive. The walls and floors were damaged by the soot and smoke due to it going through the duct work of the home. 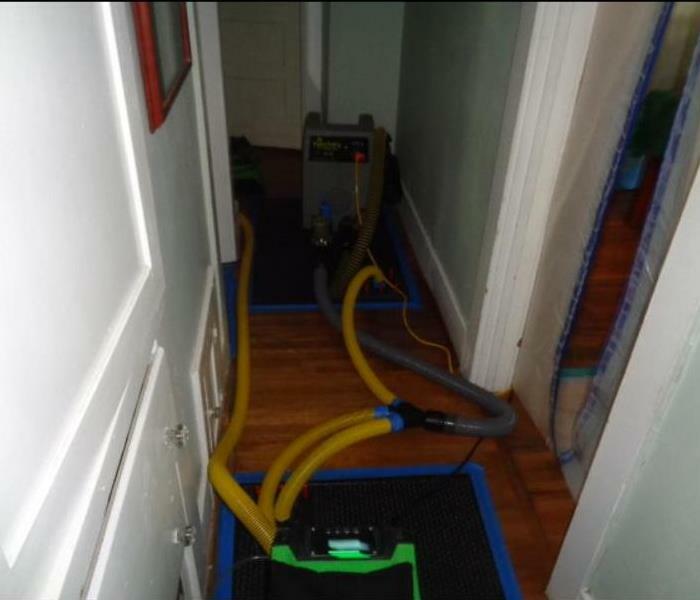 SERVPRO of Silver Lake & Echo Park came in packed the family out and began the remediation. Shortly after the house was cleaned, packed back, and ready to be a home again. 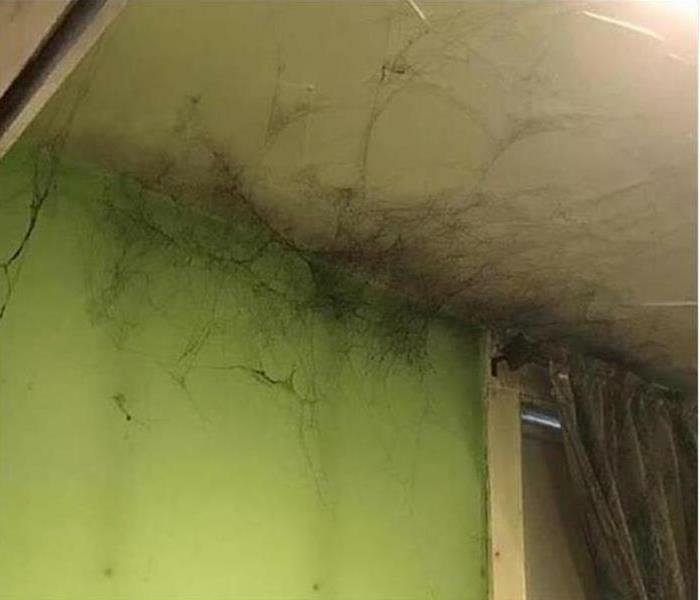 The affects of an unnoticed roof leak left a good part of this ceiling covered in mold. SERVPRO was called to remediate the home. A clearance test was preformed and passed. The ceiling drywall was put back and left looking brand new. The family was able to come back home at ease knowing their home was in good hands. 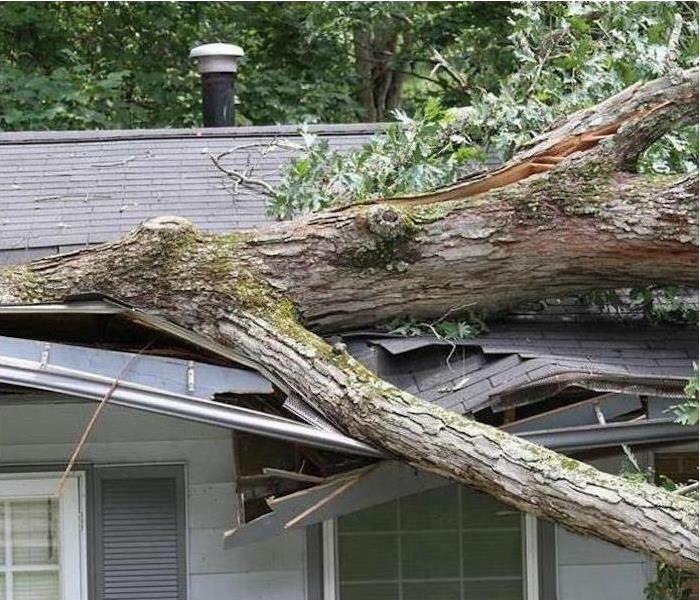 After many thunderstorms and gusty winds a trees limb was blown off and landing on the roof of this Los Angeles home. When SERVPRO of Silver Lake / Echo Park arrived the storms where still rolling. They put a tarp up so no further water damage could occur in the home. After the rain subsided the sunshine came and SERVPRO of Silver Lake / Echo Park began to remove the tree limb. They then started drying out the home with various pieces of specilized equipment including fans and dehumidifiers. SERVPROs goal was achieved to make it look "Like it never even happened." When a fire suppressant system water line ruptured it cause some serious damage to this office storage area. The ceiling became so saturated the ceiling tiles began to fall. The carpets and walls needed to be dried. They needed someone to come in and help with the situation. They called SERVPRO to come in and dry out the affected areas leaving it ready to begin reconstruction. Fire damage at this Silver Lake home which involved plastics burning created these spider web like residues. The burning plastics create a smoke compound that is electrically charged which forms these unique structures. SERVPRO of Silver Lake / Echo Park has the time tested proven procedures to clean up these types of damage before they can do more harm to the painted surfaces. 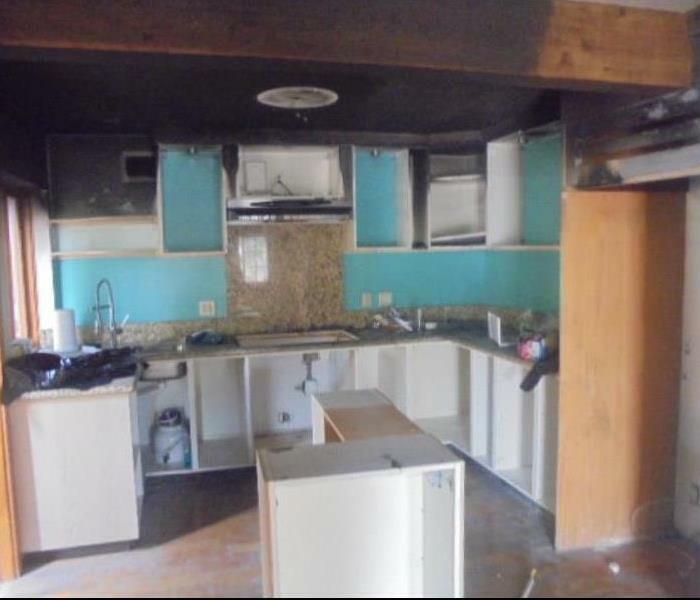 If you encounter this type of fire damage, call the professionals at SERVPRO to help. 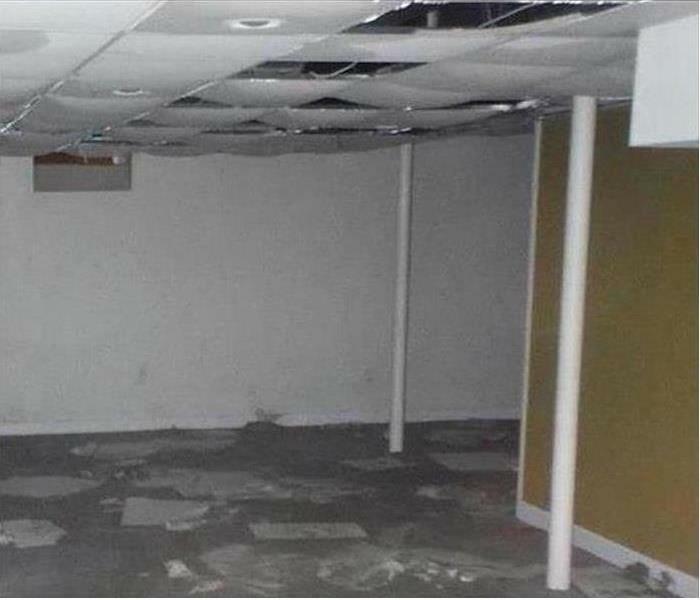 Water damage occurred at this Silver Lake office’s computer server room when an adjoining bathroom had a pipe fail, and water flowed through the walls. SERVPRO was called in to clean up the water and dehumidify the room as there was a considerable amount of moisture in the air. We worked all weekend on the project, and everything was ready to use on Monday morning. 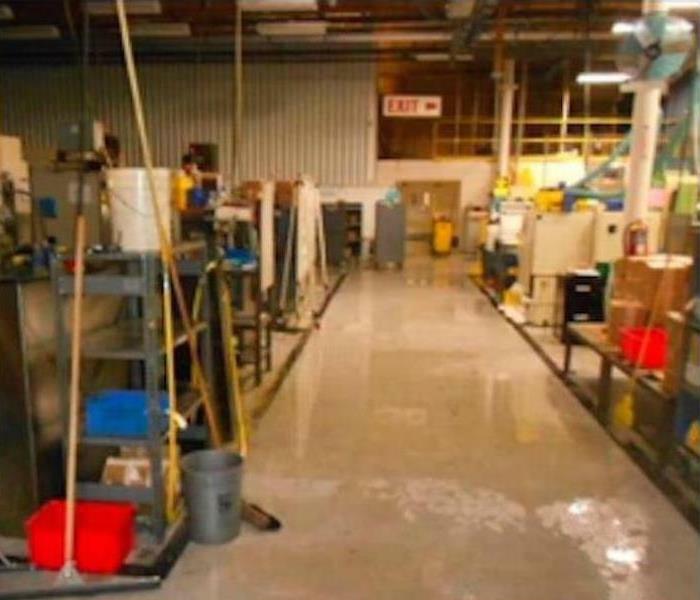 Commercial water damage at this Silver Lake manufacturing plant halted production. The floor was covered with water. Electricity needed to be shut off. The plant managers needed water damage remediation, and they needed it quickly. They called SERVPRO of Silver Lake / Echo Park. Storm damage occurred at this Silver Lake home when a powerful thunderstorm dumped inches of water onto this unfinished home site. The lower portion of the home, including the garage shown here, had a layer of standing water on it. The water was easily cleaned up with truck mounted extractors. The concrete slab had absorbed a lot of moisture and need to be dried using air movers and dehumidifiers. This was the aftermath of a home fire in SERVPRO of Silver Lake/Echo Park when we arrived. There was debris, soot, and affected structure to the home. The owner was please with how fast we got out to her home. Then when the crew commenced to clean and remove debris and soot she could believe how it looked much more cleaner. 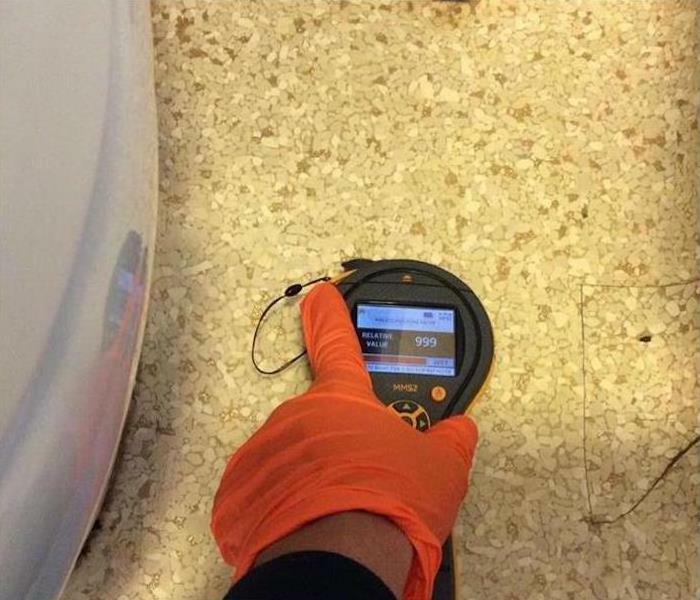 Water damage at Silver Lake is shown being detected by one of SERVPRO’s sophisticated moisture detection meters. If you have a water damage event, you can’t be sure that hidden moisture remains that could lead to mold. SERVPRO can detect this hidden moisture and help you prevent future problems. 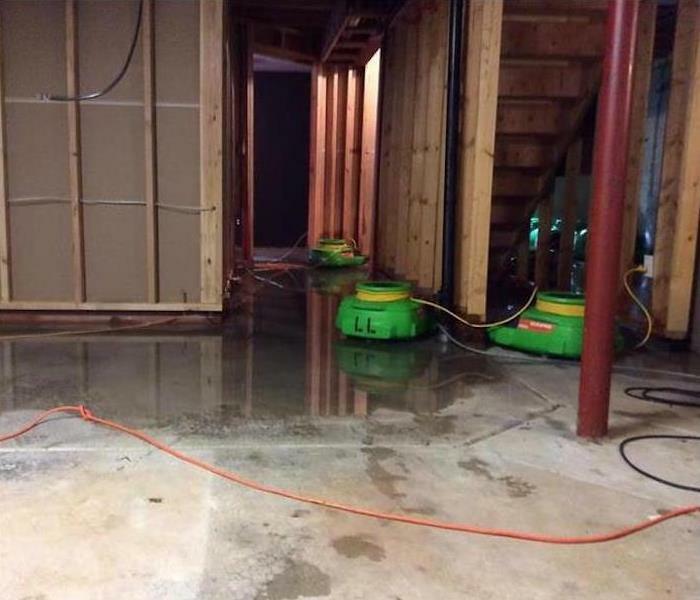 If water damage impacts your home or commercial facility, call SERVPRO of Silver Lake / Echo Park at (323) 255-1000. We proudly offer 24-hour emergency service, and we are equipped to deal with any size disaster. SERVPRO of Silver Lake/Echo Park was called out for water mitigation. The hardwood flooring had started to buckle and therefore we decided on removing flooring. As we removed the flooring we realized there was mold but that wasn't a problem we let the homeowner we would deal with it and it would be "Like it never even happened". The customer was relieved we did the water mitigation and the mold remediation. SERVPRO of Silver Lake/ Echo Park was called for possible mold underneath crawlspace. When the tech went underneath home he saw the extent of mold and the reason why there was mold. Us being SERVPRO "We are always here to help". We dried the wood framing and remediated the mold. 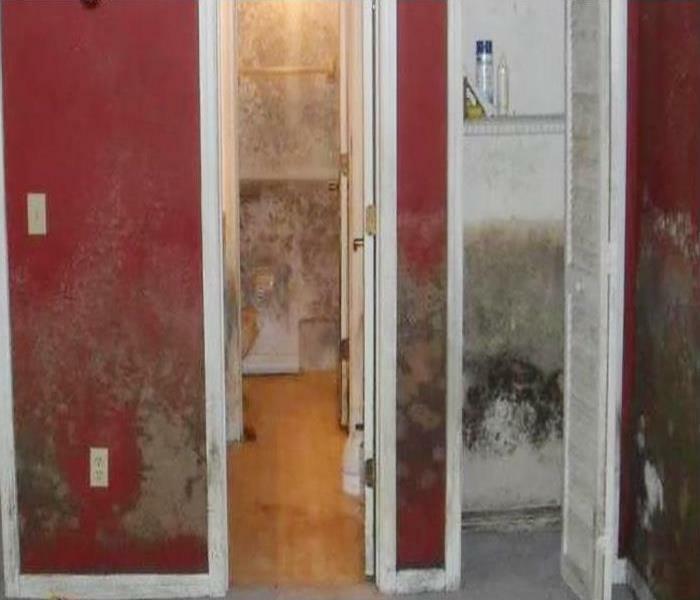 Finding mold is something no one will want to experience. This customer had a water leak which he thought was his only problem but than mold was discovered. This homeowner did not have to worry for long because SERVPRO of Silver Lake/ Echo Park fixed the problem right away the customer couldn't believe how clean it looked when we were finished. "Like it never even happened." Yvette and Bert sponsoring in The Magic Castle BOMA Event of Greater Los Angeles. Enjoying a night after a long day of work from water, mold, and fire restoration. They watched magic show and dined.